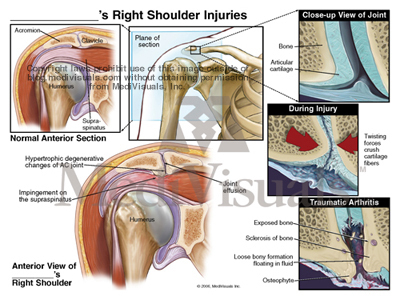 Injuries to the spinal and paraspinal ligaments and muscles can result from violent side-to-side motions or by violent excessive flexion and extension. 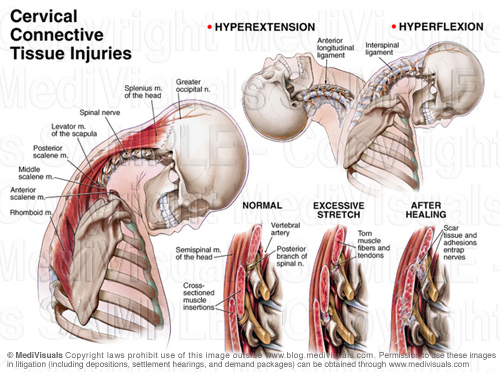 The illustration below shows the major ligaments of the neck (anterior longitudinal and interspinal ligaments) in hyperflexion and hyperextension, which can be injured grossly or microscopically. The series of three illustrations in the bottom right corner (which is shown in more detail below), show a close-up view of the spinal anatomy in 1.) the Normal condition, 2.) during Excessive Stretching and 3.) After Healing. In the Normal condition, one can appreciate the close relationship between the muscles, nerves and blood vessels. 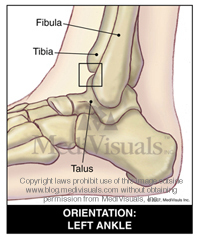 During Excessive Stretch, small tears occur, which causes bleeding in the muscle fibers. After Healing, scar tissue and inflammation entrap blood vessels and nerves resulting in a permanent state of compromised, painful movement. The same is true for the lower lumbosacral spine and pelvic regions. In the illustration below, the spinal nerves and their posterior branches are seen in close approximation to the ligaments and joint capsules, which are often involved in the injury. 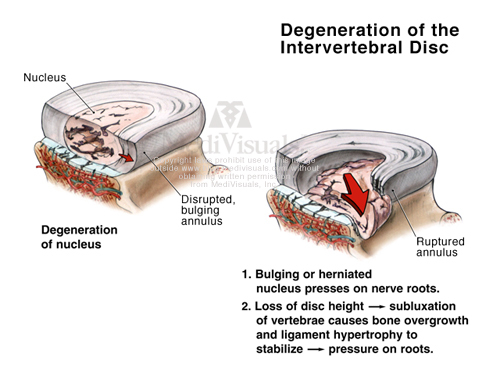 During hyperflexion of the lumbar spine, transient bulging of the intervertebral discs can occur. 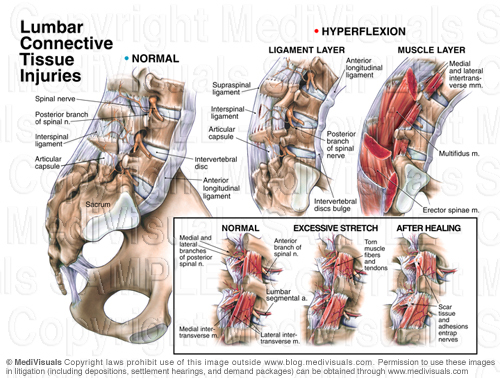 The series of illustrations in the lower right corner of the above image, show the normal lumbosacral and pelvic muscles and tendon fibers, which insert on the bones near the associated posterior spinal nerve branches. During Excessive Stretch, a segmental artery and its branches may be involved in hemorrhaging, scarring and occlusion. After Healing, scar tissue and adhesions form, entrapping nerves and blood vessels, causing chronic pain. In these next illustrations, muscle is shown in sequentially higher magnifications, which can be used to explain excessive stretch injuries in any area of the body. In the Normal series, the bottom illustration depicts nerves and small body vessels intertwined in muscle with its tendinous attachment to the bone. 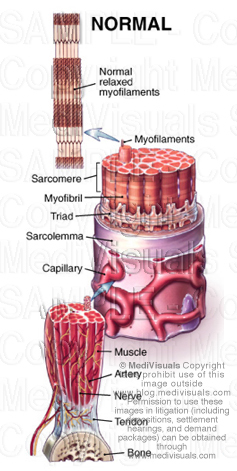 The middle illustration shows a magnified view of an individual muscle fiber and the top illustration depicts the relationship of the microscopic myofilaments (actin and myosin) in their normal relaxed position. 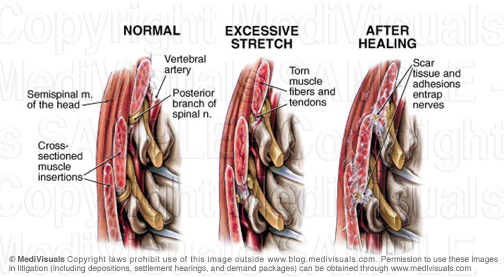 In the Excessive Stretch series, the bottom illustration shows the muscle, tendon, blood vessels and nerves as they are excessively stretched. Small hemorrhages are seen escaping from the stretched and torn blood vessels. 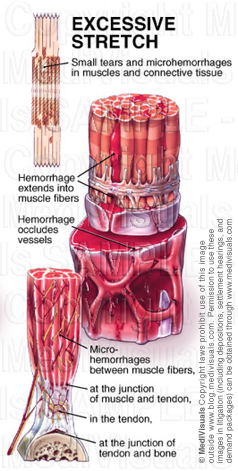 In the middle illustration, blood is shown escaping into surrounding spaces, reducing oxygen exchange to the muscle and irritating the delicate structures of the muscle fiber. 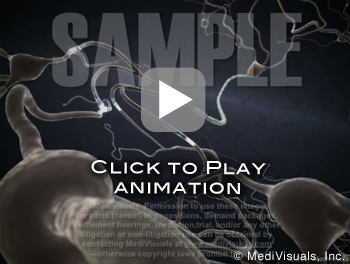 The top illustration depicts the myofilaments, showing the actin and myosin fibers torn and stretched past the point of normal interdigitation. In the After Healing series, the bottom illustration shows the irregular outline of the scarred and inflammed muscle fiber with small adhesions seen between the blood vessels, nerves and muscle fibers. 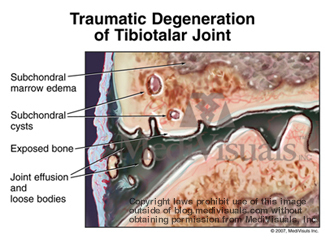 The middle illustration shows scar tissue and inflammation occluding blood vessels and adhering the delicate structures of the muscle fibers together, limiting motion and causing chronic pain. 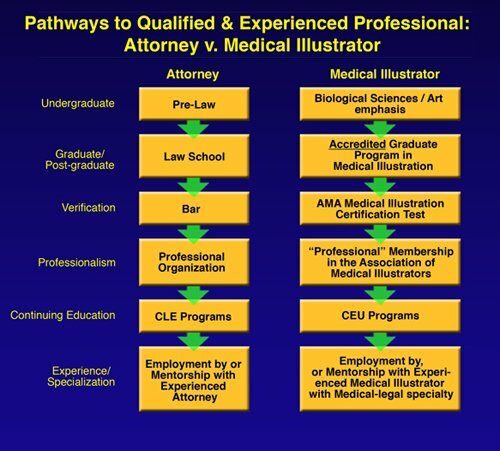 Lastly, the top illustration depicts the damaged myofilaments. Their normally well-organized, interdigitating arrangement is left destroyed, limiting muscle movement at the most basic level. 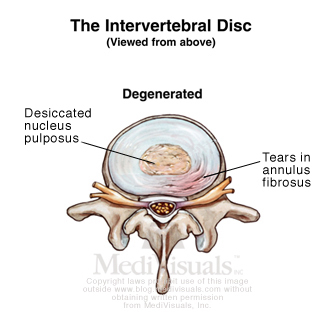 The term “degenerated disc” is generally used to describe a disc in the early degenerative process. It is the beginning of a progressive break down of the disc. This condition can be initiated or accelerated by a traumatic event. 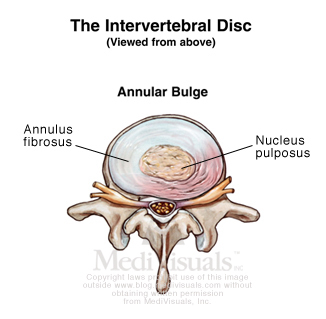 A disc bulge is a more advanced collapse of the disc to the point that the disc expands beyond its normal contour. It may or may not impinge on the neural structures within the spinal canal or neural foramina.  Similarly, a disc bulge can be the immediate or delayed result of a traumatic event, or a traumatic event may exacerbate a preexisting, stable disc bulge. 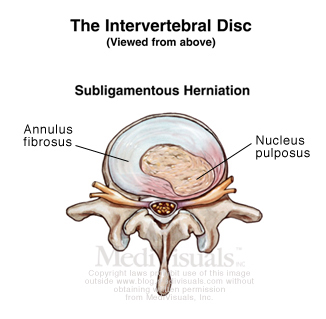 A subligamentous herniation is one in which nucleus pulposus has extended through the annulus fibrosus, but has not gone through the posterior longitudinal ligament. 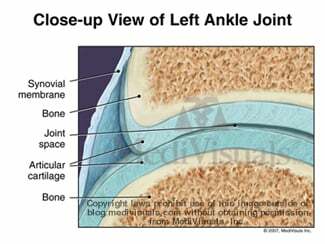 The term “herniation” is generally used when the nucleus has completely extruded through the annulus fibrosus and posterior longitudinal ligament. 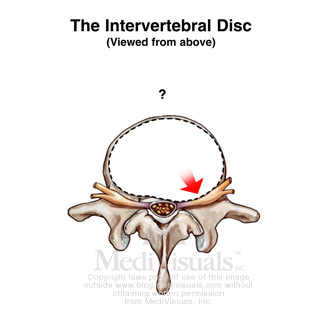 However, it does not matter what the disc pathology is labeled, if it impinges upon, or irritates the neural components, it is a significant injury that will likely require some type of invasive procedure to correct. 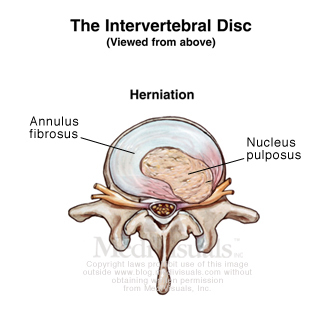 The disc can either be injured by an immediate tear of the annulus fibrosus and extrusion of the nucleus pulposus during a traumatic event, or they can be the result of a much more gradual process. In order to understand the gradual breakdown of the disc, one must first understand a little of the physiology of a disc. 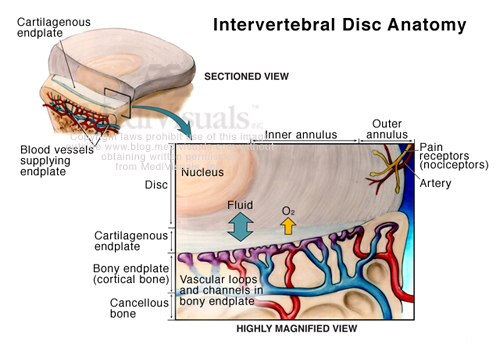 The inner disc relies on exchange of fluid, nutrients and oxygen through the end plate of the adjacent vertebral bodies. 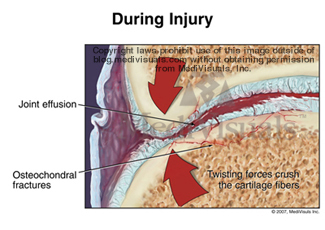 During a traumatic event, the endplate may become injured resulting in interference with that exchange. 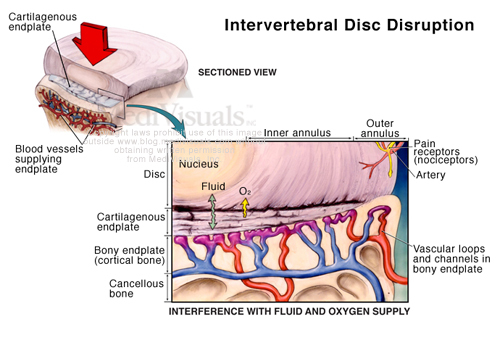 As a result of the inability of the disc to obtain the fluid, nutrients, and oxygen it needs, the disc gradually begins to break down - becoming a degenerated disc, followed by a bulging disc, and eventually to a herniated disc. The amount of time involved with the process of the disc breakdown is related to the severity of the initial disc injury. Therefore, if a disc injury is not evident until weeks or months after a traumatic event, it does not mean the injury was not a direct result of the traumatic event.